Why does the American Dream include a white picket fence? We’ve all heard of the American Dream. The popular idea of the American Dream is to get married, have kids, and buy a house with a white picket fence. But why is the fence part of the American Dream? Where did this concept come from? As it turns out, the white picket fence has a history older than America itself. The popularity of the picket fence began all the way back in colonial America. When colonists were settling America, those who were self-made would own their own homes, often surrounding their property with a picket fence. This was a highly sought-after sign of wealth and prosperity. After the American Revolution, the picket fence continued to be a symbol of wealth and class. The population grew, and people began to move out west. As land was claimed, settlers would build picket fences to show others their success. Part of the popularity of the picket fence was that it was so easy to build; even without advanced woodworking skills, all an individual would need were the supporting posts and the pickets. With the combination of the simple construction and the status provided by the fence, it’s easy to see why the picket fence continued to be an enduring symbol of success as American history progressed. After the population had spread out across America, more and more places were settled, and areas began to become more densely populated. Living in close proximity to their neighbors, many Americans found it necessary to erect a fence in order to delineate their property lines. And which fence was best to do the job? The easy-to-build picket fence. These picket fences began to be painted white, since white paint was cheap and easy to see, day or night. The white picket fence served a crucial function: the children and family dog could easily and safely be contained, while the fence itself was not so tall as the block the sight of the carefully-tended home. 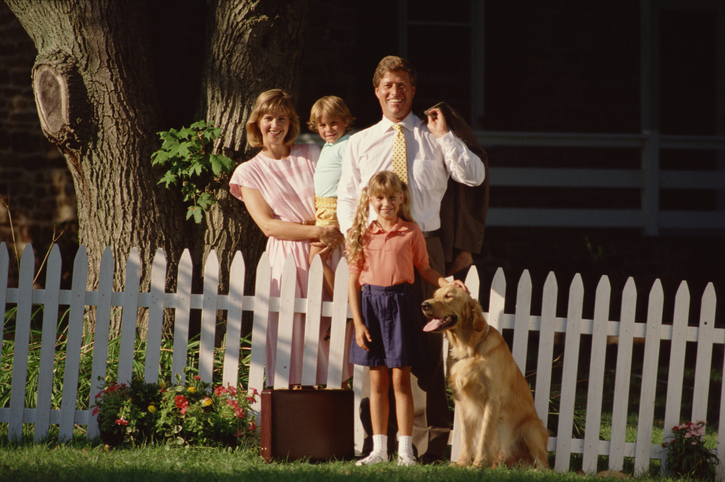 The increasing affordability of the white picket fence made it one of the most desirable assets for the growing American middle class, and thus the white picket fence became synonymous with the American Dream. This entry was posted on Friday, August 5th, 2016 at 1:56 pm. Both comments and pings are currently closed.